The fact is, many couples, particularly brides, simply don't have the time to put together a totally unique Destination Wedding, and simply don't have the money to pay a Destination Wedding Planner to do all the planning for them. And thus, the Simply Weddings Cayman wedding packages were born! We looked first of all, at items which our couples had made it clear were important to them: transportation, clean, accessible facilities for dressing, the ability to bring extra people, reasonably private beach locations, local expertise/local knowledge, reliable services which were good value, especially professional photography. Since 30% of our clients arrive by cruise ship, more than 100 couples each year, the ability to streamline the legal process involved in getting married locally was key. We also wanted to give our clients the option of doing a very basic wedding, without the bells and whistles, with the capability to upgrade and add extra services, or to include some DIY elements. 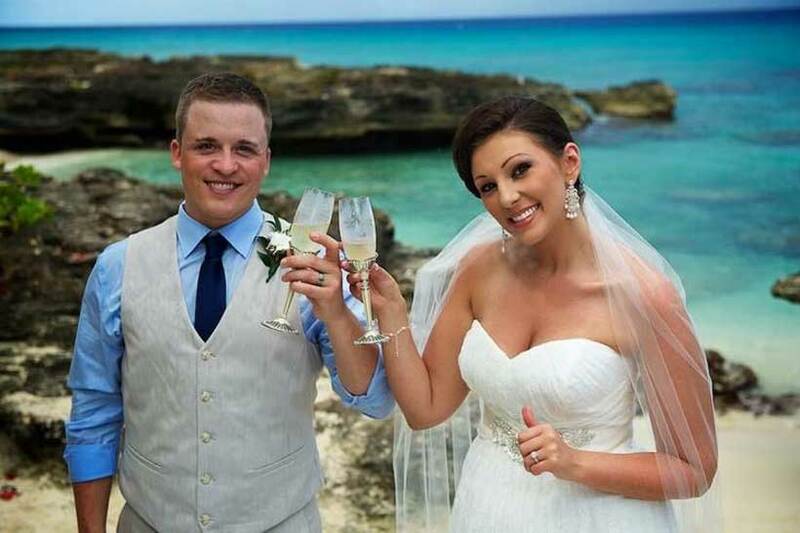 And so we set up the all-inclusive Simply Weddings Cayman packages . Currently we have two main ones, the All-inclusive Cayman Cruise Wedding, and the All-inclusive Cayman Sunset Wedding. (And see us for all inclusive Wedding Vow Renewal and Wedding Blessing packages), The thing to remember is that the most important part of the wedding, the legal requirements, are all done in advance, on -line. Moreover, we do NOT require the 90 days lead time that some cruise lines insist on. For couples arriving by air, you can fly in for the weekend and be married, as long as your paperwork is in order. 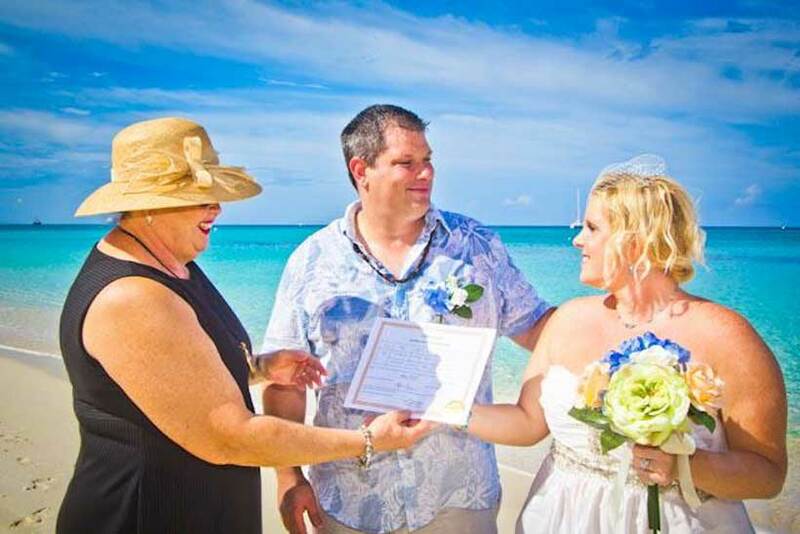 For our cruise guests, you are greeted when you get off the tender ( Grand Cayman is currently a tendered port) and brought to our office to complete the documentation for your Special Marriage License and get dressed. Once you have arrived in Grand Cayman, you can relax because all the arrangements for your special day have been made in advance. We have prepared Guidance Notes for getting married in Grand Cayman, which is a handy reference guide to what happens when. I have written elsewhere about personalizing each couples wedding ceremony, and giving them a souvenir copy of the script. The ability to connect on an emotional level with our couples is the aspect of our business which makes Simply Weddings unique. Yes, it does help that Sam and I have been married to each other for a very long time, and that we are obviously a team. Each of us has particular strengths which we put to work for you, to ensure that your day is special and stress free. Then, there are all our vendors behind the scenes, who we depend on to give you quality services, and prices which we have negotiated in advance on your behalf. So, if a stress-free, affordable Destination Wedding in Grand Cayman is something you are considering, look for our Wedding Packages for a simple beach wedding here, www.simplyweddingscayman.com and look at hundreds of happy couples captured on our Facebook page over the last 8 years here, www.facebook.com/SimplyWeddingsCayman.